A whirlwind last hour has finished with the final nine players decided to contest the final table at the PokerStars.net Asia Pacific Poker Tour: Asian Poker Open. With 15 players remaining, the short stacks came under attack – first that of veteran Kiwi Graeme Putt (15th), followed by young Aussie Joel Dodds (14th) and Jerry Bucilla (13th), who walked into the pocket aces of Joe Hachem. Guido Lunardini’s tournament finished when Dinh Le made a pair of jacks after the board missed the Thai’s K Q, and soon after, Claus Valloe’s K 8 ran into the A 10 of Team PokerStars’ Bertrand ‘ElkY’ Grospellier. 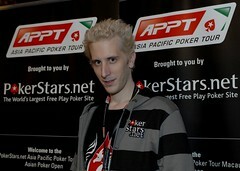 Ace-high was good enough for ‘ElkY’ to eliminate Valloe in 11th place. Almost immediately after Valloe busted, Cailin Jin fell one short of the final table line-up when his A 5 came up against the pocket queens of Sangkyoun Kim. The flop (Ah 9c As) was sweet for Jin, but one of the two queens in the deck fell on the turn, making Kim’s full house and ensuring his spot in the last nine. There, he’ll be joined by a dream field that includes Team PokerStars Pros Joe Hachem and ElkY Grospellier, Team PokerStars member Guillaume Patry and US ‘Poker Diva’ Liz Lieu. The field also includes a trio of PokerStars online qualifiers: Sangkyoun Kim from South Korea, knockabout Brit Simon Randall and 21-year-old Brisbane native William Tam. 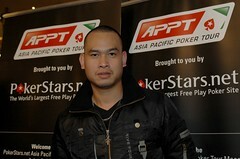 They’ll all be chasing the chip leader, Vietnamese-born Dinh Le. Play resumes at 2pm local time today. Seat 7: Guillaume Patry (TheGrrr… on PokerStars, 552,000 in chips): A native of Quebec, Canada and actually started his competitive career as part of the Quebec Junior Provincial Ski Team. By high school, Patry had already become the world’s premier Starcraft gamer and also became the first ever non-Korean professional gamer in South Korea. Residing in South Korea since 2000, he reached celebrity status in both the gaming and mainstream media of his adopted homeland. TheGrrr… gradually built his profile online but it wasn’t until this year that he made the step into major live tournaments with appearances at the PokerStars.net APPT events in Manila and Seoul. He was a massive chip leader midway through day two of the APPT Macau: Asian Poker Open main event but rode the roller coaster late in the day before consolidating his spot in the final nine. 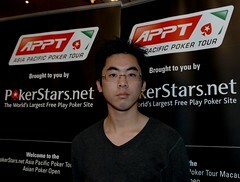 He is a member of Team PokerStars. Seat 5: Joe Hachem, Australia (Joehachem on PokerStars, 325,000 in chips): A man who needs little introduction, the 2005 WSOP champion is already a member of one of poker’s most elite clubs as one of five men to have captured a WSOP main event and WPT title after he captured the prestigious WPT Five-Diamond Classic title in 2006. Born in Lebanon, he moved to Australia in the early 1970s where he worked as a chiropractor and mortgage broker. Married with four children, he stunned the poker world by beating a record-breaking 5619-player field in the 2005 WSOP main event. Since then, he has been the catalyst for the massive growth of poker in Australia, and one of the game’s most respected ambassadors. The 41-year-old played in the APPT events in Manila and Seoul, and by reaching the final table in Macau, he is aiming to become the first WSOP/WPT/APPT champion. 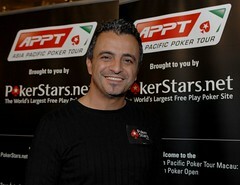 Joe Hachem is a Team PokerStars Pro. Seat 1: Simon Randall, UK (Vuka on PokerStars, 125,000 in chips): He might be the short stack, but this affable Englishman will provide plenty of entertainment value at the final table. 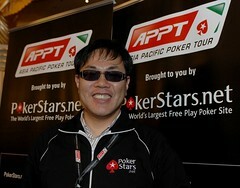 The owner of two comedy clubs in West London, he brings a stack of poker experience to the PokerStars.net APPT Macau: Asian Poker Open having played for more than 25 years (he joked that he was playing poker before most of the final table participants were born)! An aficionado of Seven-card Stud, he was swept up in the Texas Hold’em boom at the start of the new millennium and has acquired some valuable experience at tournaments such as the PokerStars EPT in London and the 2006 WSOP. The 45-year-old father of two will be cheered on at the final table by his wife Vishna. He earned a ticket to Macau via a $100 Double Shootout on PokerStars. 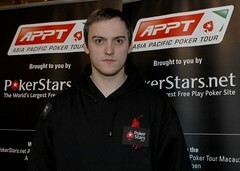 Seat 4: Bertrand Grospellier, France (ElkY on PokerStars, 467,000 in chips): Better known by his professional computer gamer ID, ElkY, this Frenchman has been living in South Korea as a professional gamer for almost six years and is one of the top-ranked Starcraft players in his adopted homeland. He regularly competes in the Korean Pro Gaming leagues, which are televised nationally. He has since transferred these exceptional skills to poker. He came within a whisker of winning the EPT Scandinavian Open in Copenhagen earlier this year (he collected $US400,000 for finishing runner-up). However, he remains better known for his online exploits on PokerStars, where he was the first person to ever reach “Supernova” and “Supernova Elite” status on PokerStars (having earned 100,000 player points in one month and 1,000,000 player points in 12 months respectively). 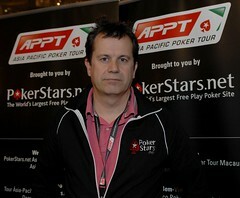 Bertrand Grospellier is a Team PokerStars Pro. Seat 9: Zhong Wei ‘Ivan’ Tan, Singapore (553,000 in chips): The great story of the final table, this 26-year-old timed a holiday to Macau with his wife around the APPT Macau: Asian Poker Open with the hope of snaring a seat on the cheap. He lined up in the first Mega Satellite, and hung on to grab the last seat on offer for the main event. He’s now in the running to take home the first prize of $US222,640 – not a bad souvenir to take back to his home in Singapore! 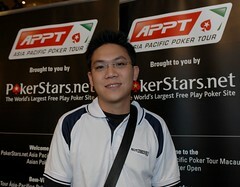 A keen poker player, he enjoys the occasional cash game but has little tournament experience and has been thrilled with the opportunity to mix it with the world’s best after gaining a taste of the PokerStars.net APPT in Manila three months ago. 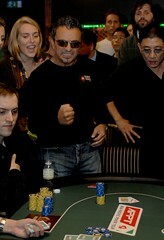 He is second in chips heading into the final table. Seat 2: Liz Lieu, USA (384,000 in chips): One of the most glamourous and recognisable faces in poker, this 34-year-old poker pro was born in Vietnam, raised in the US and has recently made the move to London. Known as the ‘Poker Diva’, she established her reputation first as a cash-game player mainly in Limit Hold’em before making her mark in the tournament arena at the 2005 WSOP with a fifth in the $1500 No Limit Hold’em event. Two more cashes, including a 12th in the $5000 No Limit Hold’em event, marked her as a player to watch. She carried that form into the 2005 Festa Al Lago at the Bellagio where she was fourth in the $2500 No Limit Hold’em event, then broke through for her first major win in 2006 in the $1000 No Limit Hold’em Tournament at the LA Poker Classic. Incredibly, she won the same event 12 months later (pocketing almost $US150,000). Seat 8: Sangkyoun Kim, South Korea (261,000 in chips): Inspired by the PokerStars.net APPT’s visit to Seoul in September, this 41-year-old father of two successfully chased a seat for the APPT Macau: Asia Poker Open in an $11 rebuy tournament on PokerStars. He’s been playing poker for about three years, but this is his first live tournament, representing a marvellous achievement to make the final table of a major event at his first attempt. He works in the insurance industry in Seoul, where his workmates and family have been keeping close tabs on his chip count via the PokerStars blog. He also ensures that the Korean-based contingent (which includes Guillaume Patry and ‘ElkY’ Grospellier) is the dominant force at the final table. Seat 3: William Tam, Australia (walrus_poker on PokerStars, 201,000 in chips): The APPT Grand Final will be held at Sydney’s Star City Casino next month, so it’s appropriate that a casino dealer from a sister property to Star City should make the final table of the APPT Macau; Asian Poker Open. Playing in his first major live tournament, this 21-year-old (he only celebrated this milestone birthday last week) is a dealer at Treasury Casino in Brisbane, Australia. Born in Australia to a Vietnamese mother and a father originally from Hong Kong, he’s been playing poker for several years but only decided to try his luck in Macau after cashing fifth in a Sunday Million warm-up on PokerStars. He ensured a spot at the final table when he doubled through ‘ElkY’ Grospellier late on day two when his pocket jacks held up against the Frenchman’s A Q. This page contains a single entry by Brad "Otis" Willis published on November 25, 2007 4:23 AM. PokerStars Makes Headlines at the 2007 Grey Cup was the previous entry in this blog. 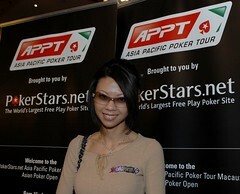 APPT Macau 2007: Lights, cameras and action (almost) for the historic APPT Macau final table is the next entry in this blog.